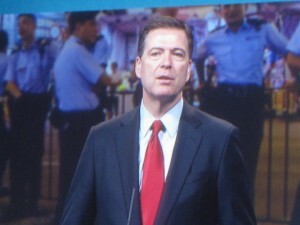 FBI Director James Comey met privately with Connecticut police chiefs Tuesday and encouraged them to become a part of the dialogue about policing and race, the Associated Press reports. Comey described the discussion as productive but declined to discuss specifics. “As you would expect in the Nutmeg State, it was a thoughtful and rich conversation,” said Comey, who still considers Connecticut home after working in the past for Westport-based Bridgewater Associates. It was Comey’s second visit to the New Haven field office since taking the helm nearly two years ago. Comey said he is trying to make the FBI more diverse but the bureau has struggled to get enough applicants.